IsoRubber Top is a 3mm thick acoustic insulation that is adhered to a floor surface, absorbing impact sound and vibration at source. A composite of sustainably sourced granulated cork and recycled waste rubber, IsoRubber Top has a global warming potential of zero and an ozone depletion potential of zero. 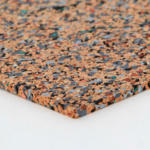 IsoRubber Top provides a means of using problematic waste material to the benefit of the environment. It would normally be glued directly to the top of a concrete subfloor as per manufacturer’s instructions.